Mesa Contemporary Arts Museum opened its 35th Annual Contemporary Crafts exhibition last month in the Dobson Main Gallery, displaying handmade artwork juried by Independent Curator Julie Muñiz, who chose thirty-five artists representing fourteen U.S. states. As one of the artists selected for this prestigious exhibition, I traveled over 2000 miles each way from my Philadelphia-area home to see this incredibly diverse commingling of craft within the company of fellow artists and an impeccable curatorial display to impress. Widget Locket #2: Homage to Old Technology is a continuation of my inquiry into how Victorian mourning jewelry can be evolution-ized into modern technology and its resulting transience becoming the viewer’s focus of the locket interior. 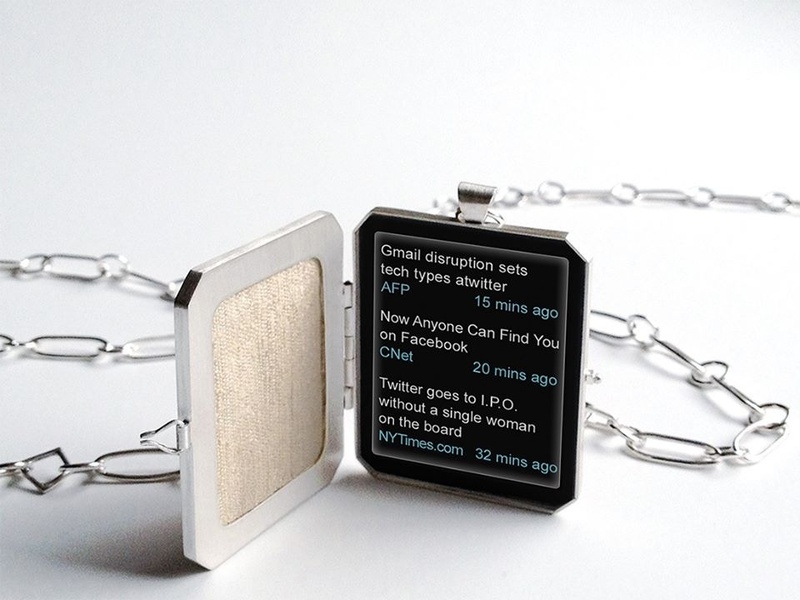 Using snippets of text headlines borrowed from scrolling news widgets across computer screens and smartphones, the locket reveals an unexpected snapshot of stories that parlay technology and how it consumes our personal lives. Just like its complementary jewelry piece, Widget Locket #1, the entirety of this piece is handmade, from the sterling oval chain links, fabricated silver locket body to the hinge, bail and clasp mechanisms; the text is created digitally in Adobe Illustrator then placed behind Plexiglas inside the silver locket, also covered in a delicate fabric. 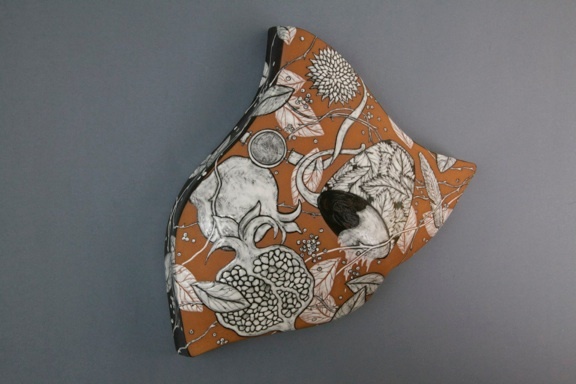 Farraday Newsome, “Genetic Drift Cloud Tile”, glazed terra cotta, 16 x 14 x 4”, 2012. Photo courtesy of Indigo Street Pottery, Mesa AZ. 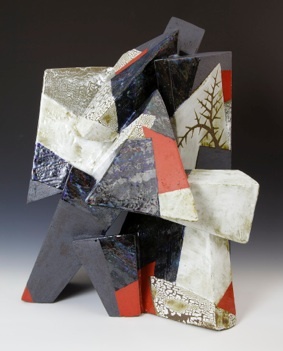 Jeff Reich, “Allthorn”, glazed stoneware sculpture, 23 x 18 x 18”, 2012. Photo courtesy of Indigo Street Pottery, Mesa, AZ. In contrast to Newsome’s ethereal wall pieces, clay sculptor Jeff Reich creates these magnificent angular slab and handbuilt forms in stoneware, such as his Allthorn piece. One can readily see the artist’s influence of the painterly abstract expressionist movement, as he creates exciting surfaces with angled geometric triangles and parallelograms of red and blue-marbled color. Reich describes his inspiration: “The clay forms I create are inspired by natural rock formations, boulders fallen upon each other or a tree’s erratic growth during drought.” In addition, the artist cites the Sonoran desert of Arizona as pivotal to what inspires his clay work. The sgraffito surfaces of Allthorn show a crackling thorny brush in the piece’s upper right portion, likely what one hiking through the southwestern desert terrain may encounter. 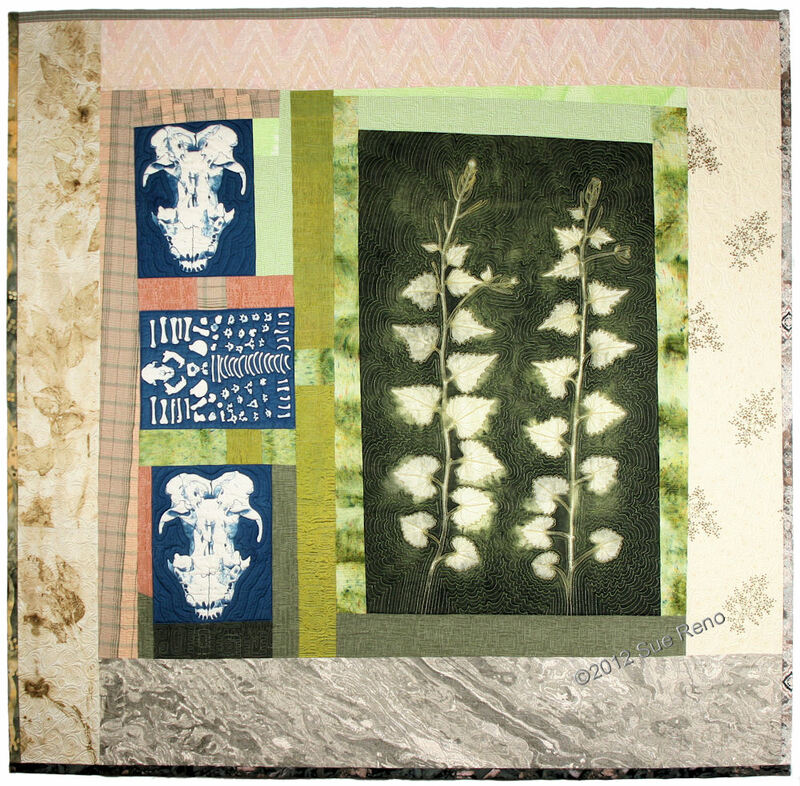 Sue Reno, “Skunk and Garlic Mustard”, cyanotypes on cotton, heliographic print on silk, artist-painted, vintage embroidery, stitching, 50″h x 51″w, 2012. Photo courtesy of the artist. The only other artist to represent the Northeast U.S. in this exhibition (besides myself) is fiber artist Sue Reno, who lives and works in the Lancaster County, Pennsylvania area. Skunk and Garlic Mustard is a wall-hung quilted construction that employs fiber, photographic printing processes and hand-stitching techniques. In the rural area and woods surrounding Reno’s home, the artist encounters noxious weeds that grow uncontrollably such as garlic mustard and finds remains of native wildlife, such as this entire skeleton of a skunk. In the left-hand middle section of this quilt, Reno meticulously arranged each bone and hand-stitched them into controlled and “stable” linear patterns, almost like a dissection or a presentation. However, on the opposite side of this controlled order, one sees organic fluidity and meandering movement of a vine sprouting upwards, and brings an earthy sense of beauty in her use of forest-green tones to an otherwise pesky and irritating weed that is the bane of Reno’s home gardens. 35th Annual Contemporary Crafts national juried exhibition can be viewed through April 13th, 2014 at Mesa Contemporary Arts Museum, located within the Mesa Arts Center at One E. Main Street in downtown Mesa, Arizona. Oh Patricia, I enjoyed this so much. I really love art that deals with what initially appears as opposing concepts and then shows them up to be harmonious or at least, connected. Particularly humans diverse needs both organic and nonorganic. This is one of the reasons I like your work. Your locket says it all. Sue Reno’s work is spectacular and I delved a little deeper into her work, loving it. Thank you for showing us all these works. Sharon, I’m so ecstatic that you saw this post – as I knew you’d find Sue Reno’s work to be just as you said here: spectacular! I found it so difficult to choose just a few works from the exhibit to present – as there are over five other stellar fiber artists showing their work, too. The juror wrote an amazing statement for the show’s catalog – essentially summarizing how organic vs. technological can come together into one event, yet work together harmoniously, as you’ve also so wonderfully mentioned in your comments above! Thanks so much for your always-welcomed visits to artdoesmatter and sharing such spirited prose! Thank you for this post, Patricia, and for introducing us to these wonderful artists. What a thrill it was to discover Farraday Newsome and Jeff Reich – their treatment of clay is so creative. Seeing your excellent “Widget Locket” side by side with Farraday’s terra cotta piece is fascinating. Both pieces echo similar concerns, but in very different mediums, and with their own unique approach. How satisfying! Dominique – even though I seem to have visually “bonded” with Farraday’s clay work nearly immediately as soon as I saw it, I didn’t consciously realize till now why. Thank you for pointing me in the direction of clarity, as I do agree with you! Our work addresses the same concerns involving time, fragility and yet, the techniques are vastly differing. I can’t possibly tell you how much I appreciate your wonderful commentary and for dropping by to visit today! I adore the locket of yours chosen for this show, and also what you said about technology consuming our personal lives. It’s been said that artists are “antennae for the species,” and that seems to be true for you, Patricia, a self-proclaimed internet afficionado. You’re able to take your observations (and distractions) and turn them into functional, wearable, thought-provoking, and ultimately gallery-worthy art. Major props, lady! Gina, you know me too well! I cannot deny anything – you are so wonderfully spot-on with understanding just exactly what I’m trying to say in my jewelry, and for this – I appreciate more than I can ever say. Thank you sooo much for stopping by and sharing such an uplifting and incredibly succinct, lovely post!! Congrats to you also on the recent shows of your amazing work! My pleasure, Patricia! I always enjoy reading your posts. Hi Patricia: I have been lagging behind in blogging. Thank you for this beautiful post. Congrats to you for displaying your widget locket #2, which is beautiful! Good luck to all your future endeavors! Denise, thank you so much for your lovely comments. 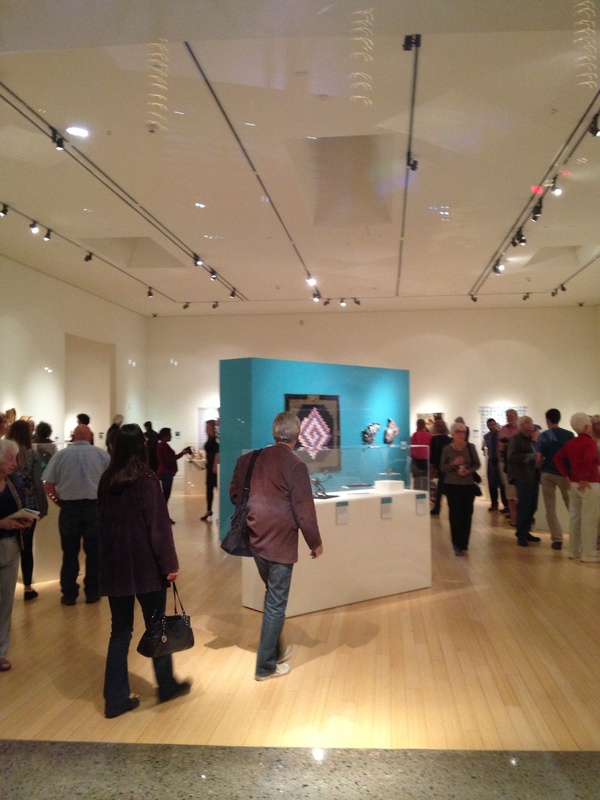 This exhibition was truly a stellar experience for me, as well as all the artists involved. Congrats to you on publishing your latest book, also! I’m so happy you stopped by today! Thank you for remembering me. Good luck, Patricia!